There’s always a time and a season to road bike in Arizona, which carries a special appeal because of the diverse array of landscapes. Moreover, the state, with more than 80 percent of its countryside belonging to the public, offers dozens of blue-line highways with hundreds of scenic miles of cycling. In the summer, northern Arizona’s high desert and mountain towns make for especially appealing day trips. Alpine-like forests and meadows around the Flagstaff area provide a cool backdrop for hours-long rides. Along the northern reaches of the state, you tour through country that has always attracted adventure-seekers. Sculpted and painted by Nature, this high desert canyonland carries a mystique that draws people craving an outdoor challenge or just a scenic look. Following are a handful of routes to get you started with discovering northern Arizona from behind the handlebars of your road bicycle. Special Considerations: This road closes when the first snows hit, any time after October 15th, and reopens May 15th. The National Park Service charges $20 to enter the park; $10 for individuals on bicycles. 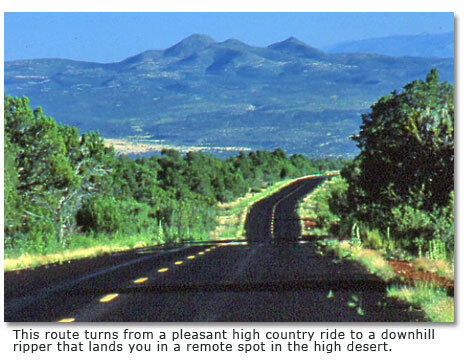 Starting Point: Just south of U. S. 89A on Arizona 67 between milepost s 579 and 580 at the Kaibab Plateau Visitor Center. Special Considerations: Watch for blind spots between Bitter Springs and Marble Canyon. Less experienced cyclists should start at Marble Canyon. 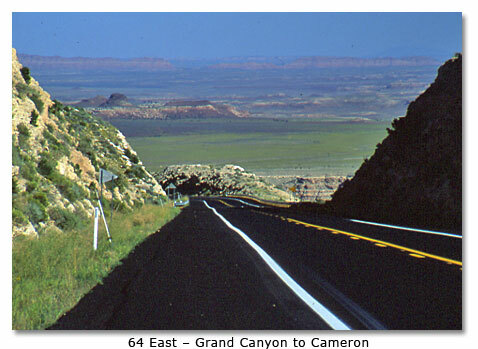 Starting Points: 1) About 25 miles south of Page off U. S. 89 at the beginning of U. S. 89A; or 2) About 14 miles from U. S. 89 on U. S. 89A at Marble Canyon. 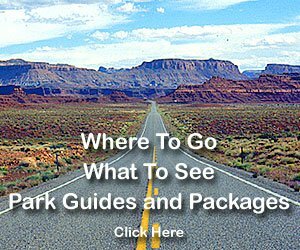 Unless you have a shuttle to drop you at the south end of U. S. 89A or permission from the Navajo to park on their land, park at Marble Canyon. With the Echo Cliffs rising to the east, and the stratified Vermilion Cliffs angling across the horizon straight ahead, this route shows some glamorous geology in the Arizona Stripthe remote segment of Arizona located between the North Rim of the Grand Canyon and Utah. Designated the Vermilion Cliffs Scenic Road, you’ll travel some of the loneliest, but prettiest, country in the state. Milepost 565 starts a long, strict climb up the Kaibab Plateau. By milepost 573, the route reaches Ponderosa Pine forest and doesn’t stop climbing until its end at milepost 579, Jacob Lake. From there, you may continue to the North Rim or return the way you came. Special Considerations: The last few miles are a steep downhill scream on an old, little-used road. Stay focused to avoid mishaps on chewed-up parts of the road. Starting Points: From Route 66 in Williams, go to 4th Street and turn south. This road becomes Perkinsville Road; milepost 185 first mile marker. This route turns from a pleasant high country ride to a downhill ripper that lands you in a remote spot in the high desert. The first 11 miles have you traveling through loose-knit Ponderosa forests surrounding yawns of grassy meadows with rollers starting midway and lifting you into aspen country. You finally top out around milepost 174 with panoramic views showing the area’s volcanic history as you start to make your descent into the high desert. The ascent back up to the forest can be a daunting one for cyclists less experienced with climbing. If you fit in that group, make your turning point here. It only takes a few miles to land you into a pinion-juniper forest. At milepost 162, signs give a one-mile warning of the pavement’s end. If you don’t have a shuttle waiting at the bottom of the hill, take a few moments to gear up for the climb out and return the way you came. Special Considerations: If you haven’t mastered l-o-n-g downhill screamers, practice before you start this route. The National Park Service charges a fee to enter Grand Canyon National Park: $20 per car or $10 for individuals on bicycles. Starting Points: From Grand Canyon Village, head east on Desert View Drive (Arizona 64); milepost 241 first mile marker. This route takes you from the cool high country of mixed conifers along the rim of the Grand Canyon to the high desert floor of the Painted Desert. During most of the first half of the route, you pass several viewpoints of the Grand Canyon via a handful of casual rollers. Your first major descent comes at about milepost 255, which drops you into a pinion-juniper forest. Then the rollers get more serious, transitioning into long, steep hills until the grand descent at milepost 265a practically constant downhill run for about the next 20 miles. If the scenery and downhill zooms are not enough to satiate you, the Cameron Trading Post, a mile south of the route’s end on U. S. 89, will serve up one of the best Navajo tacos on the Rez. Special Considerations: The National Park Service charges $5 for up to 7 days’ visit. Starting Points: About 13 miles north of Flagstaff on U. S. 89 at the signed turnoff for Sunset Crater; or 23 miles north on U. S. 89 at the signed turnoff for Wupatki. When nationally recognized bicycle expert, Tucsonan Richard Corbett, first planned the Great Arizona Biking Adventure that travels from the Grand Canyon to Tucson (hosted by the Tucson chapter of GABA), he discovered the Sunset Crater Loop. It ended up his favorite route in the state. The route starts at a parking area just outside the Sunset Crater National Monument, travels through the lava flow produced by Sunset Crater, and descends down to the Painted Desert past a number of Indian ruins in Wupatki National Monument. 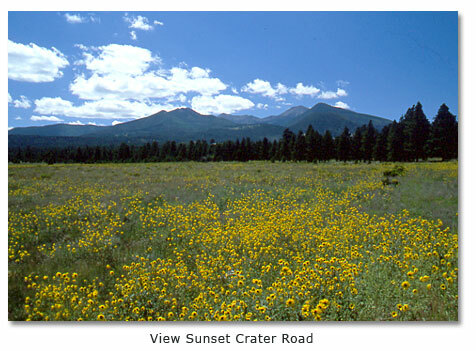 Along the way, the route passes right by the San Francisco Volcanic Field’s youngest volcano, Sunset Crater. The 1,000-foot-high crater, with its distinctive ruddy-cinder top, shows itself early in the route, rising in the distance from Bonita Park, and then disappearing around silky curves. In August, the park fills with wildflowers. Special Considerations: Locals suggest practicing on Mars Hillthe mile-long road up to Lowell Observatory (located at the end of West Santa Fe Avenue) before tackling this route. Starting Point: About 7 miles north of Flagstaff on U. S. 180. The road starts on the uphill and never stops until you reach the parking areas for two popular hiking routes: one contours the south face of Mount Humphreys; and the other climbs to the top of the 12,633-foot mountain. The average time to cycle the route ranges from the mid-30 to high 40 minutes. Top riders will finish under 30 minutes. Special Considerations: Bring rain gear for summer thunderstorms. Starting Points: 1) In the town of Flagstaff, from Route 66, head south on Milton, and turn right (west) onto Forest Meadow, then left (south) onto Beulah; drive a short distance, and turn left (east) onto Lake Mary Road; or 2) continue on Lake Mary Road for six miles to where the bike lane starts and park at parking area at Canyon Vista Campground. 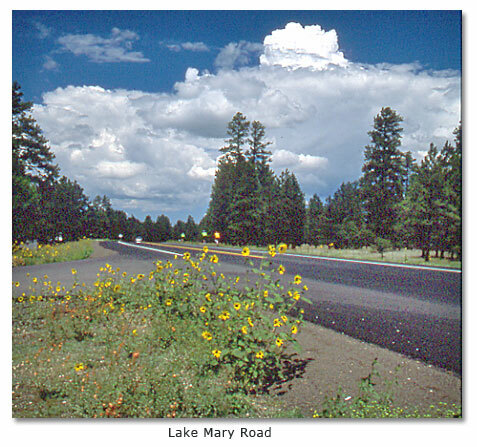 One of the Flagstaff favorites, Lake Mary Road will transport you from downtown Flagstaff into the city’s wooded meadow countryside strung with small lakes and big open meadows. The combination of green sprawling meadows separated by colonies of Ponderosa Pine trees, blue lakes, and colorful carpets of wildflowers still creates a pleasant atmosphere. Like most open spaces, the landscape has a soothing effect. The continuous wave of rollers makes it a perfect ride. Author's bio: Christine Maxa book (photographed by David James), Cycling Arizona  The Statewide Road Biking Guide (Westcliffe Publishers) will publish this fall.